No more greasy and yucky skin after a long day out in this humid weather! With Wotnot’s Facial Wipes, its 100% soft natural fiber wipes in a convenient pack will make sure that you stay radiant all day long! It contains all-natural ingredients such as aloe, rosehip oil and Vitamin E that is ideal even for the most sensitive skin. JUDGMENT: I have oily/combo skin type that is acne-prone and sensitive at the same time, but this wipes didn’t break me out. It’s tough on makeup but gentle on my skin. I love it! Like I said, I got this through my August Bellabox, so if you haven’t read that post yet, just click here. Last month’s box, by the way, is the bomb in my opinion. 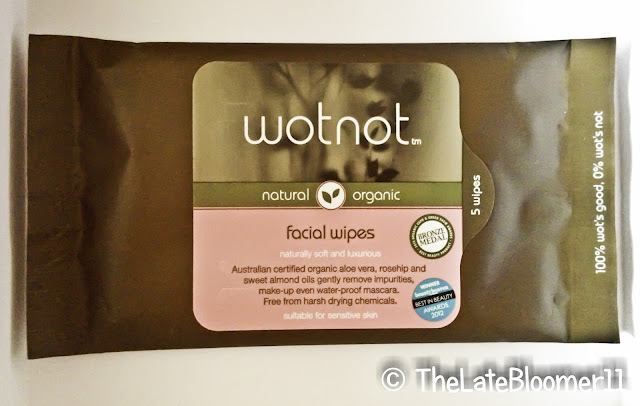 I didn’t find anything that I wouldn’t use or that I’d throw away, especially not this facial wipes from Wotnot. Whenever I’m shopping for facial wipes, I always make sure that what I’d pick would not only be effective in removing makeup, but would also be gentle on my skin. I also always opt for the fragrance-free one. Imagine how happy I was when I first tried these wipes. It’s unscented! Hoorah! Also, this is my first time to use an all-natural wipes. I initially thought that because it’s so gentle it might not cleanse my face thoroughly, but I was completely wrong. It’s soft and luscious and it does the job wonderfully. Cleansing my makeup off with this remover wipes has been a pleasure. What makes these wipes effective, gentle and hydrating, you may ask? Well, the Australian Certified Organic aloe vera, rosehip and sweet almond oils that it contains are to blame. Organic aloe vera is known worldwide for its many uses which include its ability to re-hydrate even the most sensitive skin. Same goes with almond oil which is an effective emollient and aids the skin in balancing water loss and restoring back moisture to the skin. Furthermore, the cloth Wotnot used is 100% free of synthetic materials making it feel soft on our skin and highly indulging on our face. This wonder wipes do not contain chlorine, sulphates, petrochemicals, parabens, caustics, glycols and artificial fragrances. Sometimes it pays off to know not only what ingredient is in our products, but also what’s not (hence wotnot, get it?! haha) in it. There’s just one thing I noticed when I was using this to remove my makeup. Although it claims to effectively remove even water-proof mascara, I find that I needed to swipe more than I used to with my other cleansing wipes. With that said, I like that it doesn't hurt my eyes while I’m removing my eye-makeup with it. I guess I can’t have all, eh? YES. Not only does it do the job well, it is also very gentle on the skin which makes it 100% okay to use by anyone regardless of age. TO EVERYONE! You gotta try these wipes. It’s amazing!